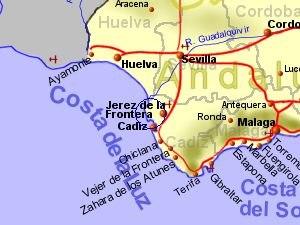 Rota is near the mouth of the Guadalquivir river, along which, some of the highest summertime temperatures are recorded. However, on the coast, temperatures will be tempered by the sea, resulting in some of the mildest winter temperatures in Spain along with bearable summer temperatures. This Atlantic coastline tends to have good seabreezes, making it a favourable location for surfing and wind surfing. There is a large area of flat land heading north up the coast to Huelva and inland to Sevilla where summer maximum temperatures are likely to steadily increase as you get further from the sea. To the south, towards Tarifa, the landscape becomes slightly more rugged where hills upto 700m can have a localised effect on the weather.